We just learned about the Citadel of Aleppo. 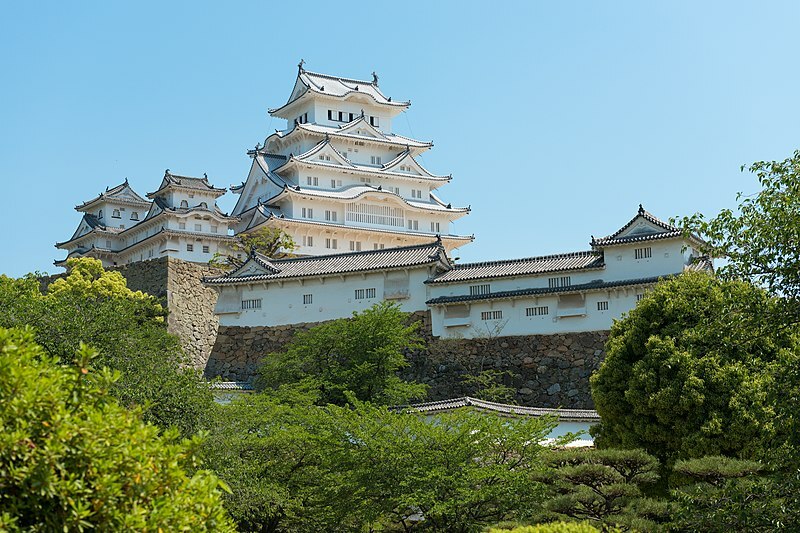 Another famous castle is Himeji Castle in Japan, built around 1300 AD. It is the largest castle in Japan, and because of its white color is sometimes called the "White Egret Castle" or "White Heron Castle" because it looks like a bird flying away. The castle is over 5,000 feet long, and the area around the castle takes up over 500 acres. Inside the castle area, the main building has 6 floors and a basement. It looks like 5 floors because from outside the top two look like the same floor. The floors go from big at the bottom, over 5,000 square feet to small at the top, only about 1,000 square feet. On the first floor there are over 300 tatami mats, which are special made floor spaces, and lots of weapons. Each wall has weapon racks for holding spears and guns, and once had about 280 guns and 90 spears. There are arrow slits through all the floors to shoot arrows at attackers, and the upper floors had places that people could come out and throw things at attackers below. Outside there are three moats, and a big maze of pathways that go around and around the castle, up hills and in small spaces. This was to make it so even if an army did attack, the castle would see them coming a long way out and be able to stop them with the moats.